The spacious atrium at the Imperial Hotel. In Osaka, finding a well-priced and spacious room comes with a few compromises. Finding space at a reasonable price is the age-old challenge in Japan; the stereotype of it as a restrictively expensive destination is the first thing most people ask about when I mention I am heading there. 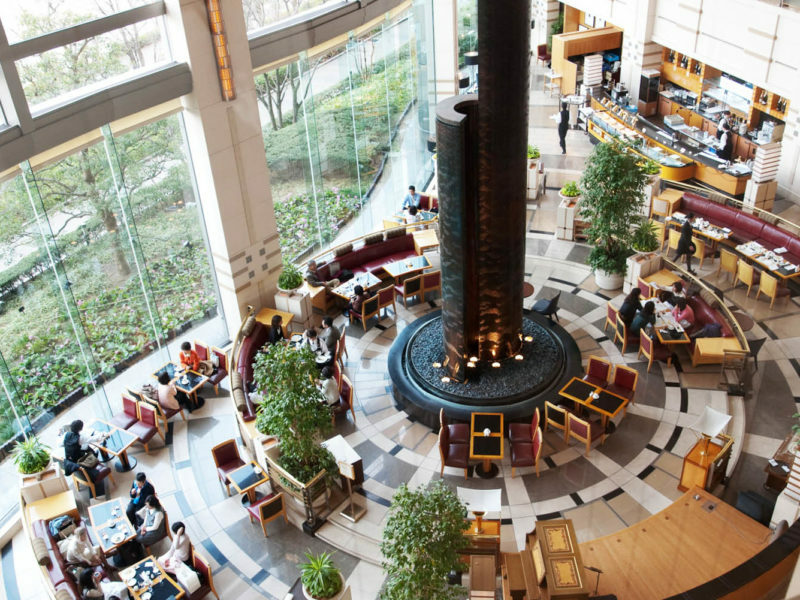 So the Imperial Hotel Osaka’s budget-friendly price tag was a real drawcard when visiting the city to sample its famous culinary scene and clock up some time at The Wizarding World of Harry Potter. Having arrived hours late after a medical emergency on our flight resulted in an unscheduled stop in Guam (and a Shinkansen trip from Tokyo having missed our connecting flight), we are taken through the check-in process with typical Japanese efficiency and quickly shown to our room. Even through a fog of fatigue I register the ample proportions, before crashing on the super-sized, super soft bed. The Imperial Hotel’s rooms are gorgeous to say the least. The next morning I pull the curtains back on a spacious room with twin double beds, lots of floor space, a generous writing desk and cosy seating area, all rendered in a signature hotel palette of beige, brown and russet. There’s lots of wardrobe space and the room is flooded with light through giant windows that afford a view of the river below. The touches were classic with a luxury feel, the bed was supremely comfortable and it did indeed feel like a home away from home. The real winner though is the bathroom, which can sometimes be hit-and-miss in Japanese hotels; I have stayed at a few places where they were presented like little capsules that you step up into, like on a cruise ship. Here there’s cheery cream and white striped walls, an ample shower and full-sized bath behind their own glass door, wet room-style, and a vanity area with seating. The hotel’s setting is gorgeous in cherry blossom season. Back downstairs, after a good night’s sleep, I can appreciate anew the expansive lobby. 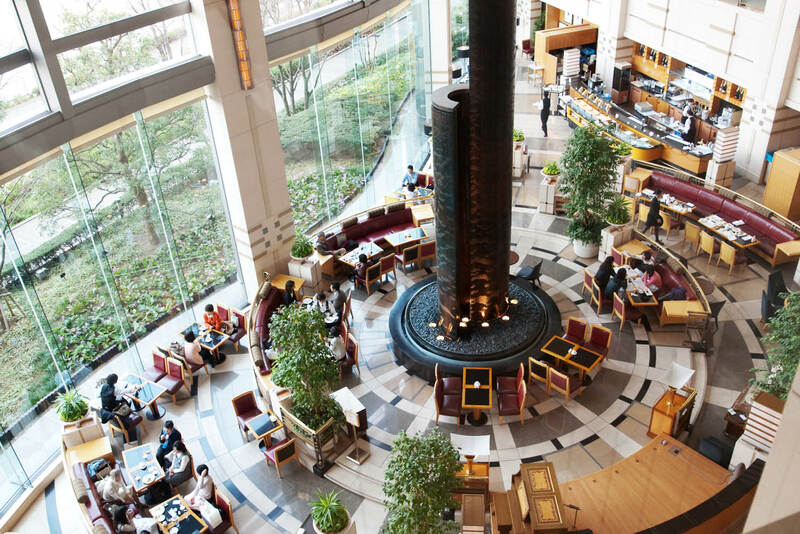 There are several dining and drinking options on-site, including a signature Japanese restaurant and the Old Imperial Bar, which pays homage to the architect Frank Lloyd Wright, who designed the original Imperial Hotel in Tokyo, but there’s lots of choice at the shopping and dining complex right next door at a fraction of the cost. We breakfast there before heading out on our daily trek; the compromise for the small price and big size. The Imperial is not exactly centrally located – attractions like Osaka Castle are a fair hike, and bits of the waterfront walk and some of the pedestrian bridges across the river are less than picturesque. There is a cute neighbourhood railway station close by though, and the hotel offers a free shuttle bus to JR Osaka Station. But the walk is a small price to pay (literally) for being able to soak in a nice long bath in the generous bathroom of my large room. The Imperial Hotel, 8-50, temmabashi 1-chrome, kita-ku, Osaka, Japan. The riverside setting is very pleasant (especially in cherry blossom season), but it’s a hike to see the sights. Suitably luxe in proportion and execution, it ticks the big hotel boxes but doesn’t exactly ooze character. Clean, bright and comfy, the space is a real bonus, especially when travelling with family. There are plenty of dining options, and the Old Imperial Bar is worth a late-night cocktail; there’s also a fitness club with a pool that costs extra to use. I paid $232 per night for a standard twin which, given its size and its 4.5 star rating, is amazing value for money.